Frances Xavier Cabrini was the first citizen of the United States to be canonized as a saint. Born Maria Francesca Cabrini at San Angelo, Italy, she was naturalized as a citizen of the United States at Seattle in 1909. Frances was sent to a convent school at an early age, and dreamed of becoming a missionary in China. At the age of twenty-four, she went to a small orphanage in Codogno called the House of Providence, to help in the management of this institution. During this time, she attracted several other women to help in her work, and in 1877 seven of them took first vows. Shortly after, the House of Providence was closed down, and the bishop encouraged Frances to found her own order of missionary sisters. The nuns were called the Missionary Sisters of the Sacred Heart, and their ministry was the Christian education of girls. The sisters spent the next few years setting up schools and homes for children throughout Italy. Then, in 1889, Pope Leo XIII asked Frances to sail to the United States to work among the Italian immigrants there, and Frances left for New York with six other sisters. 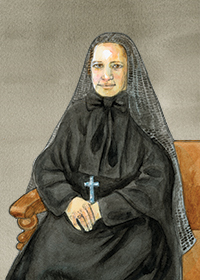 Within three months of their arrival, Mother Cabrini had already founded an orphanage and a school. In the thirty-five years before her death, she was to open sixty-seven hospitals, schools, orphanages, convents, and other foundations in the United States, Central America, and South America. Despite a great dread of water, Mother Cabrini sailed the oceans more than thirty times in her missionary work. Although she discounted talk of miracles in her life, there are several recorded instances of special favors. One account tells of a sister who had suffered for many years from varicose veins. Her doctor had advised her to wear elastic stocking at all times, but somehow, she obtained a pair of Mother Cabrini's cotton stockings. Upon putting them on, she felt instantly cured. Seeing her walking briskly the next day, Mother Cabrini asked her what had happened. When the sister confessed to wearing her stockings, Mother Cabrini told her, "I hope you are not so foolish as to say my stockings cured you. I am wearing them all the time and they do me no good. It was your faith that did it." St. Frances Xavier Cabrini is the patron saint of immigrants. A memorial honors her on November 13. Mother Cabrini's message today: The strength of the United States has come from those who have emigrated from other countries to our shores. Mother Cabrini was sent to tend to the needs of these people. Today, we seem to have lost sight of the richness which immigrants have brought to our country. Would you turn immigrants away or do you seek justice for then?